What Time is it? Just watch the fountain. As you watch the dancing waters of the fountain you may notice that at regular intervals, the shape of the fountain does something that few people have figured out. The fountain tells you what time it is. Now sometimes the fountain is busy choreographing it’s dance and will not stop to tell the time, but most of the time it finds a way to fit in a few seconds to tell us all the time. Want a hint to help figure out when the fountain is telling the time? Watch closely, It does not take much of a break out of it’s dancing to display the time, so you will want to keep a close lookout. You are looking for a pattern in the water spouts that starts on the western side of the fountain and pulses on and off for 15 seconds, like a flashing clock. When semiconductor savant Nick DeWolf unveiled the randomized rhythm behind Aspen’s Dancing Fountain in 1981, he proudly declared that its secret commands would die with him. Shortly before health issues swallowed his life in 2006, however, he had a change of heart. And so DeWolf scrambled to do what any savvy programmer would: back up his machine. 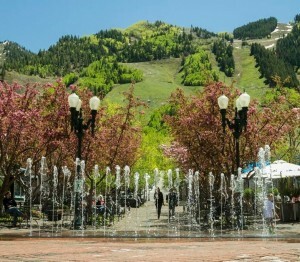 Then, in early 2009, before the fountain was to reawaken for its thirtieth summer of slapdash spritzing, the Aspen Parks Department contacted the fountain’s sculptor, Travis Fulton, and its mechanical engineer, Peter Hutter, in a panic. All three of the fountain’s replacement computers had crashed, taking the machine-specific code that conducted DeWolf’s aquatic symphony with them. The Dancing Fountain was one glitch away from standing still forever. Searches for an engineer who could decipher DeWolf’s formula, which was written in Assembly Language, stretched across the region, the state, even the country, to no avail. But months later, as Fulton and Hutter were overseeing a sculptural land-reclamation project in Old Snowmass, fate intervened. The operator of a front-end loader pushing boulders around overheard a conversation. Indeed, Rodger Hollingsworth Jr., son of Fulton’s and Hutter’s longtime Wyoming granite supplier and a computer guru, had worked with multiple outmoded processes on systems aboard nuclear submarines. Maggie DeWolf, Nick’s widow, hired Hollingsworth immediately to disassemble and rewrite the fountain’s original data in modern terms. The Dancing Fountain would dance again. The inventor, we think, would be relieved: today his brainchild boogies on.